Unlike the refrain of Bruce Springsteen’s famous song, I was not born to run. I was born to lurch. I’ve accepted the fact that my blooby, eggplant body will jiggle all over for minutes after I’ve ended the race. Just because I’ve accepted the slow pace, though, doesn’t mean I have to be reminded of it by the member of my family who doesn’t contribute anything but laughter, boogers and hugs. At home that night it occurred to me that I’ve taken the wrong approach to mother-son exercise. I have boot camp, Pilates and hiking. He has soccer, karate, swimming, skating softball and basketball. (It’s ridiculous. Once I figure out what he loves doing we’ll dial back.) He occasionally accompanies me to boot camp and mimics the Lululemon-clad ladies. But rarely are we active together. Not since he was six weeks old, when I strapped him to my chest in a Baby Bjorn for Fit Mom classes. It’s evident that in order for me to be healthy and for him to be healthy, we have to find activities that challenge both of us and that we’ll enjoy together, today and tomorrow. That charity race didn’t cut it. As a card-carrying Canadian, we try skating. I haven’t skated in 20 years. In 17 seconds I was flat on my arse. To be specific, I went splat on my coccyx, aka the tailbone. My son laughed so hard he couldn’t catch his breath. He managed to squeak, “Do it again! Fall down again! Please!” What a loving child. See if he gets a ride to the rink for 6 a.m. practices. Soccer promises a softer landing. While visiting relatives in Texas, I suggest we kick a ball around in their backyard. Suddenly there were fire ants crawling on my son’s arms, chest, neck and face. He screamed. I tore across the yard, emptied my water bottle and tried to sweep the ants away. It was too late. He was covered in painful, itchy welts within hours. So much for the beautiful game. Swimming seems like a safe bet. He’s been taking lessons so I figured success was within reach. We step into the pool and my son springs away from me with a swift kick. Thrashing. Blub. Blub. Blub. He was red and coughed a lot. Followed by absurd shrieks and cries. OK, that was me. Tempting as it may seem to spend hours playing Candy Land or Jewel Train, I’m not ready to pack it in. I know there will come a day when my son won’t hang out with me. Strangers in the pharmacy tell me he’s adorable and add, “Enjoy him now because in 10 years he won’t talk to you.” Thank you, I want to snap. That makes me feel so much better. Perhaps if I establish a pattern of exercise where we compete and set goals, it will keep communication channels open. And cholesterol levels down. 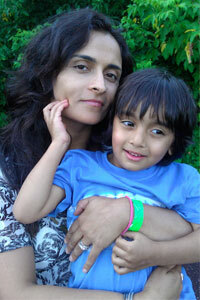 Until I discover the ideal mom/son fitness activity, we are enjoying the simplicity – and safety – of walks. He clutches me with his pudgy fist. “Your hand’s soft Mommy,” he giggles. “Mine’s itchy.” He looks at the sky, the road, then a rabbit, and in his chocolatey eyes I see innocence and naughtiness. The finish line is up ahead, but what’s the rush? Writer Amber Nasrulla intends to complete a triathlon with her son … when he’s finished growing.